We all want to save money on vacation, right? But where do you even start? You start with a plan. Knowing ahead of time where you can splurge and where you need to cut back can make a huge difference in how you spend on travel. Booking your hotel in advance is one thing, but you also need to make sure you have a good idea of how much food, entertainment, and travel to and from your destination will cost. So let’s take a look at a case study of one family of four who lives in Atlanta, Georgia, and wants to take a weeklong vacation to Hilton Head, South Carolina. 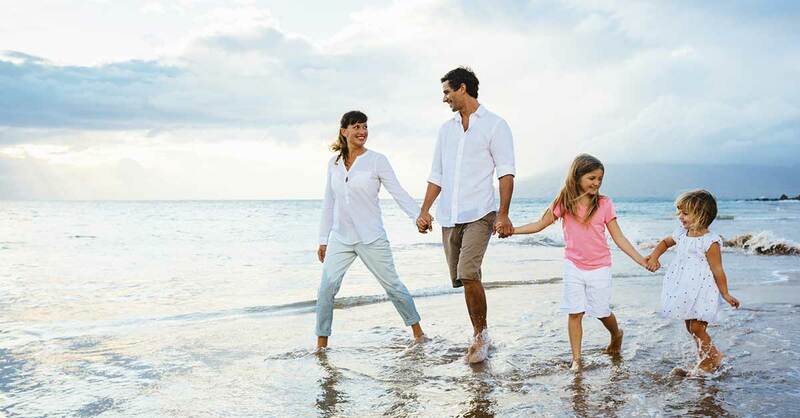 How would this family be able to plan ahead for an awesome vacation without breaking the bank? It’s 280 miles from Atlanta to Hilton Head. Unless you’re traveling in a go-cart, you should be able to make the four-hour drive on one tank of gas. We’ll estimate that to be about $40 at current gas prices. The cheapest round-trip plane ticket from Atlanta to Hilton Head is currently $400, so driving is a no-brainer. That’s $1,600 for a family of four. Keep this in mind: Depending on your destination, driving isn’t always cheaper! Between gas, restaurant stops, and wear and tear on your car, sometimes a two-hour plane trip can work better than a 10-hour drive. Do the math and make the smart financial decision. In this case, driving makes much more sense. Accommodations in Hilton Head aren’t cheap in July. So how do you save? Twenty years ago, you might have needed a travel agent. But, these days, you can find all kinds of deals online. For example, right now you could book a room at the Hilton Garden Inn in Hilton Head for $170 a night through Booking.com. That’s the best online deal out there. If you booked the same room through the hotel’s website, you’d pay $189 per night. That’s nearly $120 saved over the course of six nights. Even if your family isn’t going to high-end restaurants every night, a family of four can easily spend $75 a night on dinner, after tip. Over the course of a week, that’s $450—just on dinner! Throw in a few days out for lunch and a breakfast or two, and you can easily spend more than $600 on restaurants in a week. What if you picked one or two nights to eat out—and cooked or grilled out the rest of the time? Chicken breasts, hamburgers, hot dogs, even shrimp and fish are much cheaper when you cook them yourself. Beach vacations, especially, don’t have to be expensive. Grab some drinks and snacks, open the patio door, and watch the sunset—there’s your entertainment! Bring some board games and plan a game night. Or take along some movies and your Blue-ray player and have a movie night. If you want to explore your vacation destination, you can still get out on the town without spending a ton of money. Soak in the atmosphere and avoid all the overpriced T-shirts and souvenirs. Do research in advance to see if you can get discounts on concerts or special events in the area. Total Savings: This one’s up to you! Summer is already here, but it’s not too late to cut back on your vacation spending without cutting back on the fun. Take a look at your vacation plans to see where you could save big. If you don’t know where to start, create a free budget with EveryDollar. You can set the amount you want to spend on vacation and track it along the way. But, most of all, enjoy your vacation!